Yet again Hideout Festival has sold out in record time, having released tickets in November 2012 the Croatian event has completely SOLD OUT in under ten weeks. The promoters are now preparing to announce exciting developments on the turquoise shores of Croatia. 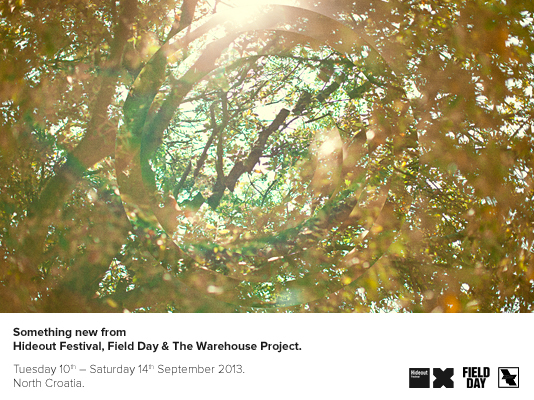 An innovative new festival from three of the most well respected music promoters in the world, Hideout Festival, The Warehouse Project and Field Day, set to take place from 10th – 14th September 2013. More information is to be released very soon regarding the new event, but for those that have missed out on Hideout Festival tickets, this new event will most certainly fill their summer search for a hedonistic paradise. 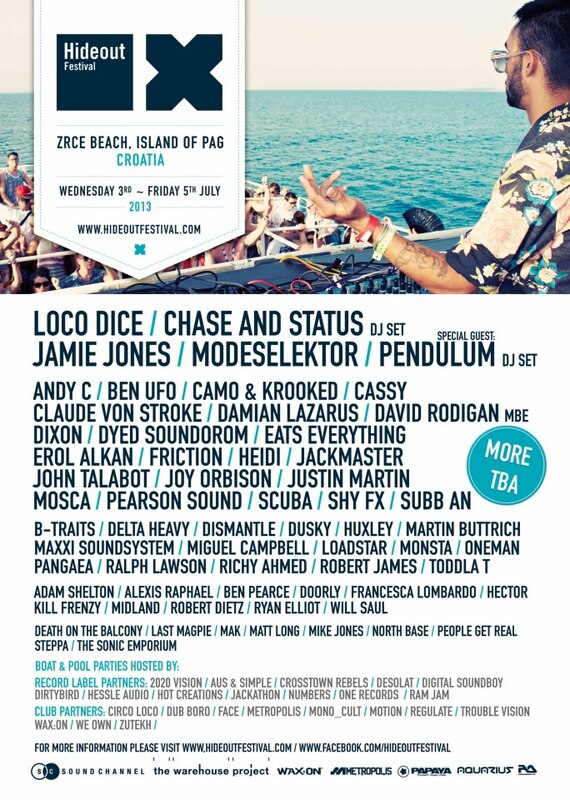 Today Hideout Festival reveals that it has sold out for the third year running. Having launched in 2011 the Croatian event set of the white sands of Pag has gone from strength to strength. Attracting both international DJs and electronic music fans alike Hideout has without doubt cemented itself into the European Festival calendar. 2013 welcomes the likes of Chase & Status, Jamie Jones, SBTRKT, Julio Bashmore, Modeselektor, Pendulum, Loco Dice and many more. Set on the stunning Zcre Beach on the Island of Pag, Hideout festival goers will enjoy daily pool and boat parties hosted by their favourite labels from Digital Soundboy to Jamie Jones’ Hot Creations as well as the idyllic experience of dancing as the sun rises above a startlingly blue Adriatic sea. In Torino from October 27th to 3rd November 2012 Movement Torino; Italy’s favourite music festival. Celebrating its 7th edition, Movement Music Festival, the Italian cousin of the world renowned Detroit Electronic Music Festival (DEMF) is back in force for 2012. Continuing on its path of exponential growth, this year an extra date in Rome is added on 31st October, ahead of round-the-clock activities for eight days in Turin. Movement once again brings original performances from the pinnacle of electronic talent and explores the depths and boundaries of the contemporary electronic music culture with the likes of Detroit exports Derrick May, Chris Liebing, Dubfire, Seth Troxler and 2 Many DJs. From October 27th Movement Festival will once again take control of Torino’s nightlife, leaving a lasting effect on everyone lucky enough to witness it’s whirlwind of excitement before the grand finale on November 3rd. The week long cultural festival returns with some inspirational venues, taking in a selection of institutional and academic buildings whilst exploring the full realms of the electronic sonic realm. To further bind the musical education daytime lectures, workshops, forums and business networking platforms, take place at various venues around the Italian city. In addition to the main Torino event, Movement are also hosting a one-night only affair in Rome on October 31st where guests of honour will beDerrick May & Kevin Saunderson will be staging HiTeckSoul, an Italy exclusive, alongside The Martinez Brothers. The event will be hosted in the Salone Delle Fontane, the capital’s 1930’s congress district and will be transformed into a magical music arena hosting some of the world’s finest DJ’s.